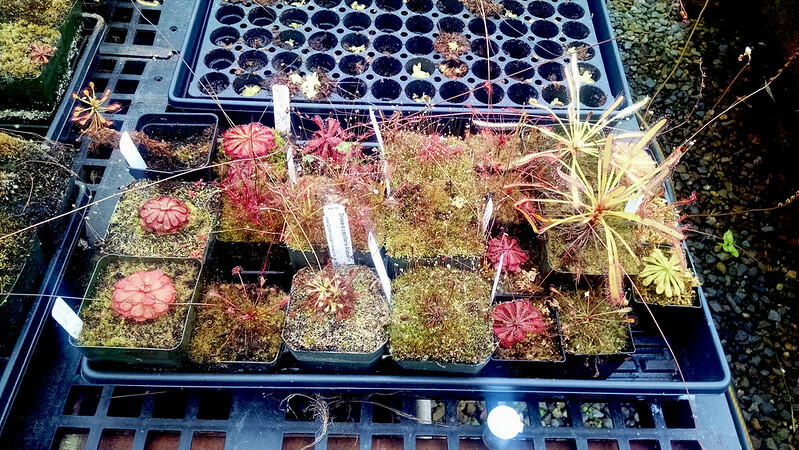 Field Trip Part 2: Dews and Pings at Predatory Plants |Sundews Etc. A couple days ago we checked out the Nepenthes at the San Francisco greenhouse of Josh Brown, owner of Predatory Plants. Today we're gonna look some of his other plants, particularly Drosera and Pinguicula. 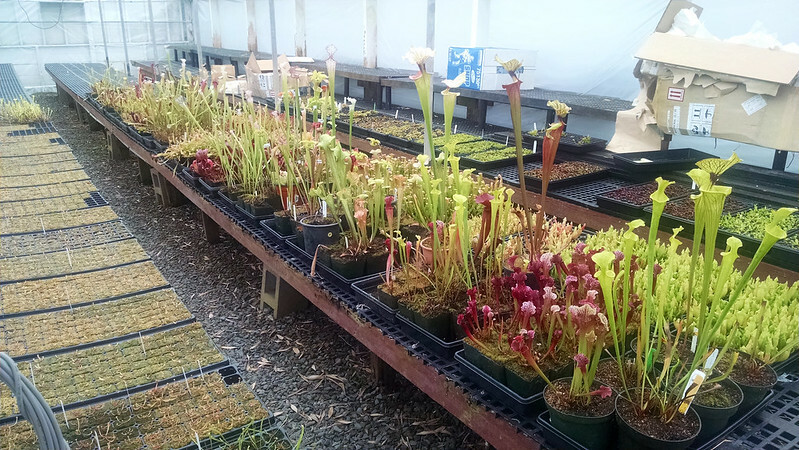 The first thing I noticed when I walked into the work area of the greenhouse, though, were these Sarracenia benches. I laughed when I saw them, because Josh is vocal in his dislike of Sarracenia (he claims he can't grow them well). Babies on the left, monsters on the right! Those look pretty decent to me! Josh does a lot of sarrs from seed (which you can see on the left), including some in-house crosses. On the right there are specimen-sized plants that he grows for flowers, or for large divisions which can be sold on eBay or what have you. In his heart though, Josh is a Nepenthes and Drosera man. 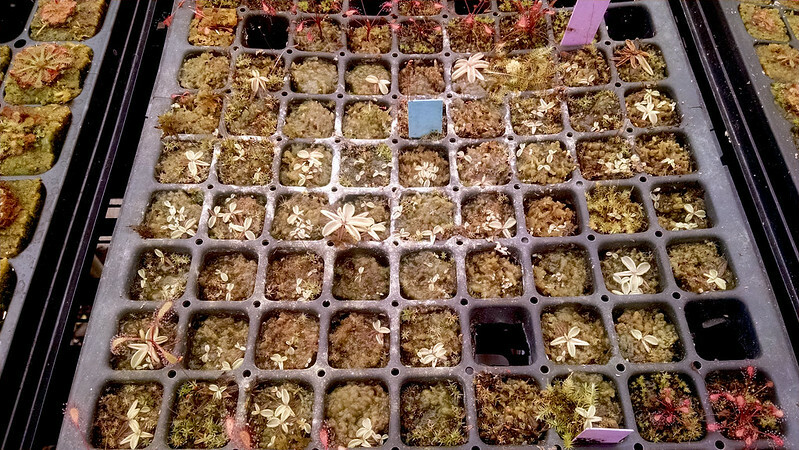 This is his "sundew ark" – the parent stock of (almost) all of the sundews he has in production, and what is pretty much his personal collection. It was cute seeing these parent plants all hanging out together. He apologized that these plants weren't all looking great, since a number of them had flowered and shrunk back a bit. Still, some of them look great, especially (to my mind) the Drosera sp. Floating (which is a form of Drosera admirabilis) on the bottom left. Next up is the production area, where he grows out all the dews he sells online and in-person. Albino-colored Drosera venusta. Super cool! 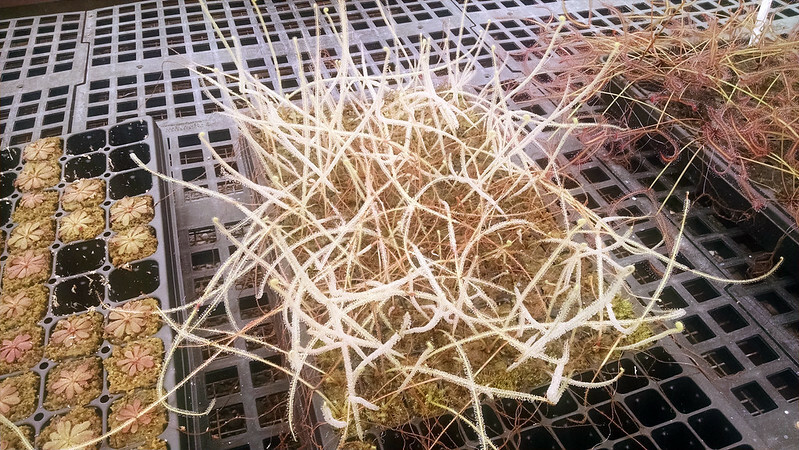 Big old tangle of Drosera tracyi. Josh has an interesting shipping method. He calls it "bare root," but it's significantly less disruptive than typical barerooting. He pops the plant – including the plug of media – out of its tray, wraps the plug up to keep it in place, and then ships it along with an appropriately-sized pot. The purchaser can then just pop it in the pot and Bob's your uncle. Pretty cool! 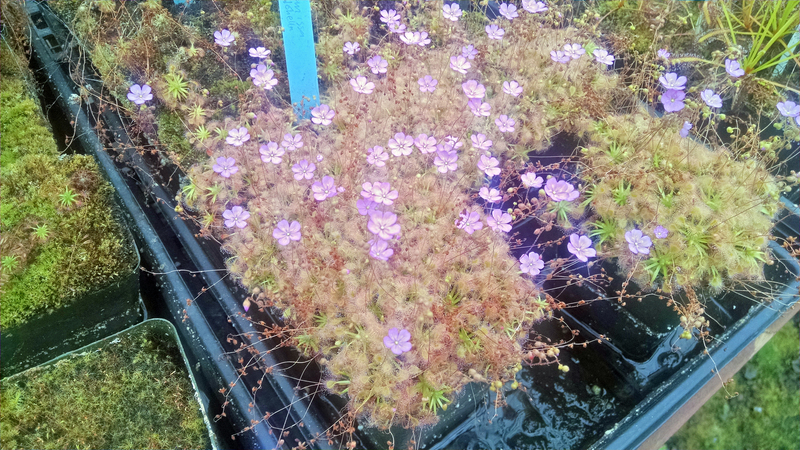 I thought this tray of Pinguicula lusitanica was cool, and Josh was pretty casually like, "Yeah, I don't know why I have those really, I never sell any." Look at all those plugs so neat and full of pings. I fully intend to lighten him of some of these plants. He meant to give me a pot, but I forgot. My own plants bloomed, failed to set seed, and died. 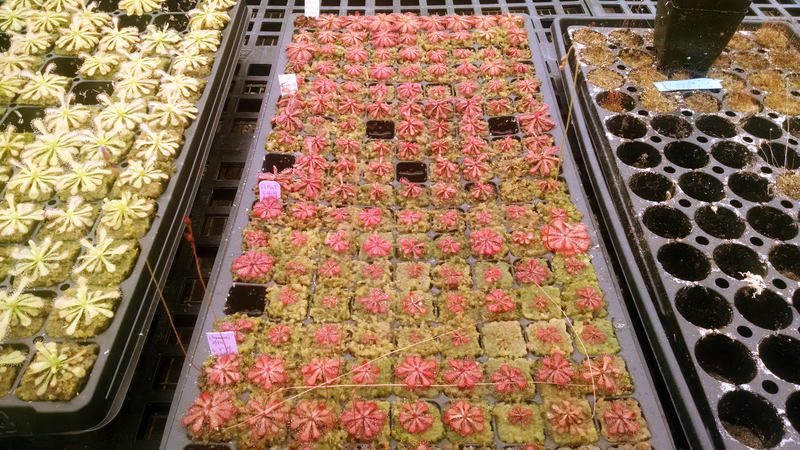 One of the interesting things about the plant trade is which plants get maintained in production, and which do not. These next two are a perfect example. 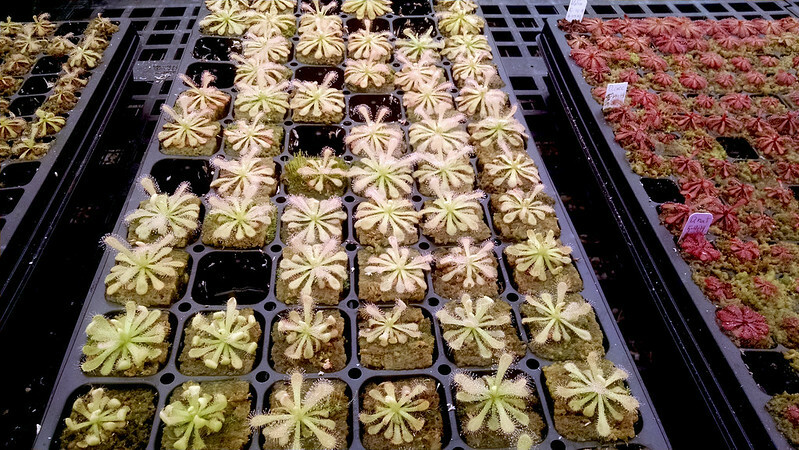 First up is the absolutely unstoppable pygmy sundew hybrid, Drosera omissa × pulchella. What a hilarious mound of plants. Josh actually lost a bunch of his pygmies this year because he never got around to harvesting and re-sowing gemmae, so when the eventual round of die-offs happened there were no contingencies. I didn't get a picture of it, but he had several trays of pygmy skeletons. It was sad. Except for these guys, which will probably never die. Look at those crazy clumps. Hybrids often have extra vigor, and D. omissa × pulchella is crazy. There's a reason that any place that sells pygmies always has loads of this hybrid. 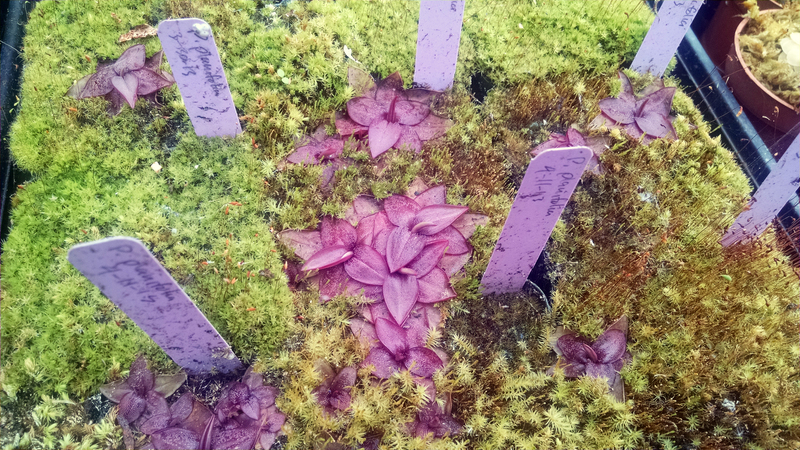 The counter to this fecundity is the rather lovely Pinguicula planifolia. It's a shape these are so hard to propagate, I think they look awesome. Most of the more familiar pings propagate very easily though leaf pulls (all the Mexican species, like Pinguicula gigantea or Pinguicula moranensis) or by buds at the leaf tips (Pinguicula primuliflora) or in rare cases, by self-pollination (P. lusitanica). This species – according to Josh – can only be propagated by crossing two different clones and sowing seed. He got this one batch of ~100 plants by crossing two plants a couple years ago, which eventually died. He's been growing these out ever since, and they've never bloomed. So while they're really lovely, don't expect to see many for sale any time soon. Alas. It was great fun checking out the greenhouse. Always cool to see how someone else solves the problems of growing our favorite weirdo plants! P.S. Maria let me know in the comments of Wednesday's post that there is in fact a Predatory Plants Instagram. Good to know. I just got an albino Drosera coccicaulis from him, didn't know they were the same species as Drosera venusta! Good to know. Also I LOVE his method of "bare root" shipping! I wish more nurseries did what he does. He hangs out with people like Mike Wang though, so then he feels bad about his own plants hahahah.